The epic journey to Machu Picchu is the expedition of a lifetime, and 1 million hikers, tourists and explorers all make the journey here annually to see the majestic city for themselves. The mysterious ruins of an ancient civilization, Machu Picchu (Peru) is a 15th century Inca site which is 7,000 feet above sea level, nestled on a small hilltop between the Andean Mountain Range. The city soars above the Urabamba Valley, and was unknown to the outside world until its discovery in 1911. How do you get there? Many opt for the train – a short 2-3 hour journey which takes you right into the heart of Aguas Calientes, your base for access to the ruins. Though those more adventurous who recognize the benefits of hiking take the Inca Trail, a 4 day journey which follows the same route the Inca’s and early explorers had to take to reach the city. Looking down over Machu Picchu. Today we’re hearing from Claudia Tavani about what it’s like to take the trek. 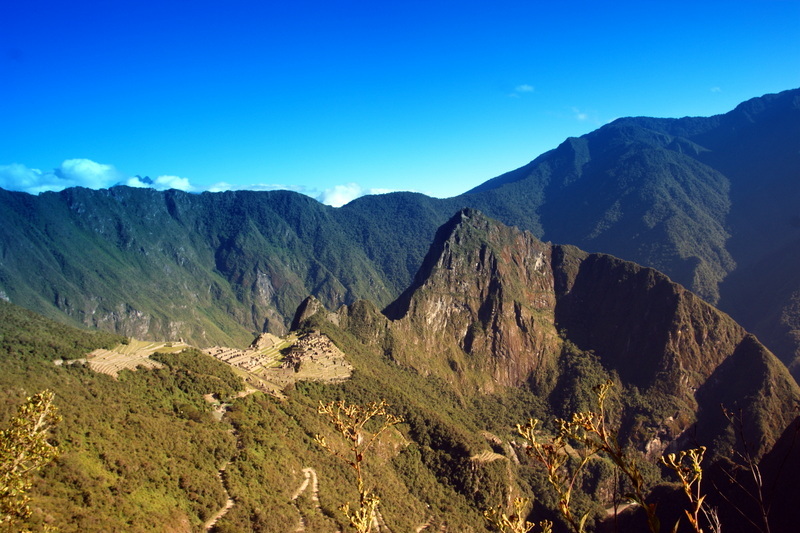 What inspired you to hike the Inca Trail? The short and simple answer would have to be the challenge. But it was more than just that. I had been dreaming to see the sun rising over Machu Picchu from the Inti Punku (the Sun Gate). I knew that the only way to get to experience that would be by walking the official Camino Inca and that solved any issues on whether I wanted to spend the money on it or opt for the cheaper alternative routes. I had been to Machu Picchu 4 years before, with no time to do the Inca Trail, and I had promised myself that the next time around I would do the trail. And yes, part of it was the challenge: would I manage to hike for 4 days on a row, sleeping in tents, without showering, going to extreme altitudes? I didn’t know! How did you prepare for the journey? Did you train? I did no more and no less than what I normally did. Back home in Italy I usually swim for training, so that made me really fit. I had not been doing that in a few months as I was travelling, but managed to keep fit with the other hikes, the bike rides, the backpack carrying. And also read up on how to prevent injuries while hiking. Claudia on the trail on day 2. Also, I made sure to arrive in Cusco well in advance to get used to the altitude. What did you expect from the journey before you began? I am not sure what I expected, really. Mostly, I was thrilled to see places that only those hiking the sacred inca trail are able to see. I felt like I was part of an elite. Were your expectations met? Was it completely different than you had imagined? They were exceded. I had an amazing time. I was lucky to be in a very good group, we supported each other, we chatted over meals, we made fun of each other. Even during the hardest times we managed to have a laugh. We felt like survivors at the end, we bonded really well. Not to mention, seeing the sunrise over Machu Picchu brought tears to my eyes. What was the weather like during your trek? We experienced all seasons in the course of four days. Spring/fall, with lots of rain around lunch time every day: a good rain coat, waterproof hiking shoes and hiking pants are a must. I felt the heat and got mosquitoes bites especially on the last two days. A good rain coat is a must. And of course, it was really cold at night (especially at night, and on day two). Tell us about your experience on the trail. Anybody doing the inca trail quickly learns there is a routine. Each day, the porters waked us up well early in the morning (actually, before sunrise). We had about 20 minutes to pack our stuff and get ready for breakfast, we would then eat all together, make a quick stop to the toilet, and start walking. We had snacks, water, and made several stops along the way till lunch time, when again we sat all together to laugh and – at times – complain about how sore or tired we were. The guides were usually with us, to provide plenty of explanations on the sites we would see, on the views and the nature surrounding us. Base camp with beautiful nature all around. When we did not need the guide anymore, we would be sent off to meet at campbase. There, the first ones to arrive (I was usually among them) could rest, shower (well, only one of the group did: the water in those showers is FREEZING), chat along, read, wander around, take pictures etc. What were your emotions once you reached Machu Picchu? I was tired and sick – that morning we had to wake up at 3:00 am and even then we were not sure we would get to see the sunrise, as a lot depended on the weather. And I had a throat infection ongoing, yet, I could only focus on what I was about to see. But we were lucky. We saw the most amazing sunrise: the light would quickly shine and invade the site, and we got to see all of this. I was so happy that it brought tears to my eyes. How long did it take you to complete the whole thing? 4 days for the trail, plus an extra one to do the Huayna Picchu mountain, that requires an extra permit and must be booked in advance. The trail is extremely social. What kind of people did you meet along the way? I had a really great group actually – we bonded really well and I made good friends with some of them. Months later, we still talk on a regular basis. The majority of people on my group were from Argentina, then there were a few people from Chile, 3 from Spain, 3 from the US, my friend and I from Italy and one Norwegian lady. Tired and happy, we posed on the sun gate. The lady from Norway did not really bond with anybody and kept a lot to herself (despite the fact that we almost all spoke English). I guess it was her choice. The rest of the group felt like one big family. 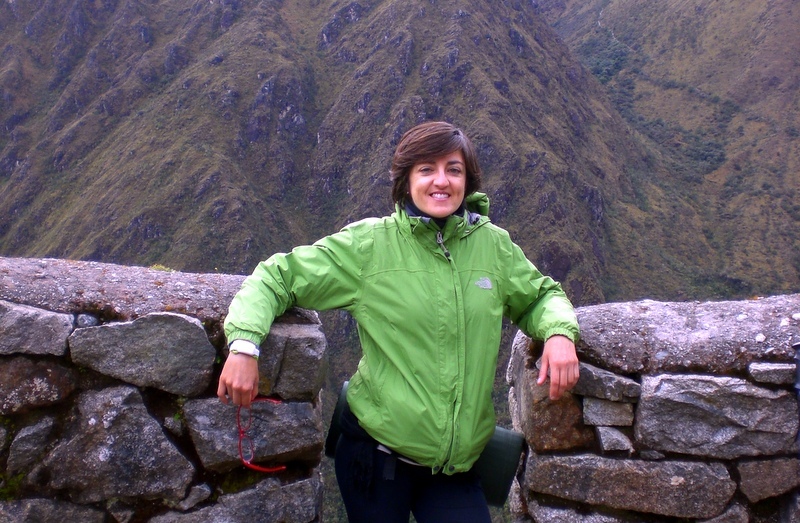 Read: Trekking the Inca Trail, Why Go With the Crowd. Does the scenery get monotonous? It never did to me. There always is some interesting flowers, some waterfalls, a lagoon, snow-capped peaks, archeological sites, breathtaking views. And as the weather conditions changed rapidly, the overall impression also changed. Do you need a map or navigation skills to complete the trail? 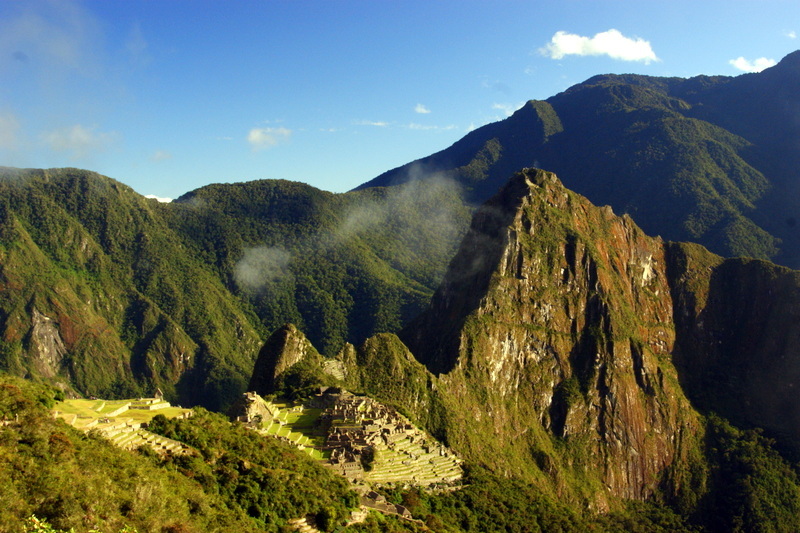 No: there is a fixed itinerary, and those walking the Inca trail have to follow it. There are guides, porters and, most importantly, check points. You need permissions and documents to get in and out. In fact, nobody can do the Camino Inca independently – you must join a guided group. What are key considerations people should think about before attempting this trek? It is hard, even for the fittest. You have to be in excellent physical conditions, and you have to carry all medications that you may deem necessary at some point or another. Never underestimate the difficulty. Once you are on the trail, there really is no going back. If it is relatively easy to walk back after day one, it really becomes difficult on day two. Never underestimate the difficulty of the trek. One traveler who felt sick in my group had to be secured on a gurney and carried down to Aguas Calientes after the second day, and this put a lot of strain on the porters who then had to come back up to re-join the group. What kind of shoes did you wear? Were the blisters? I had hiking shoes, and they are a must. I saw people on the trail who had plain running shoes but days later they had a sprayed ankle. You do need the ankle support that only hiking boots provide, as well as the grasp over slippery surfaces. What gear proved essential along the way? Hiking shoes, fleece sweaters and a raincoat, a scarf and a hat were essential. Obviously a good sleeping bag. Not to mention baby wipes – showering is impossible, so they do come in handy to freshen up a bit. Did you have to carry food/water with you along the way? We all carried our own bottle of water – it is important to drink a lot to avoid dehydration. We were given snacks each day, but I would suggest to carry chocolate bars or peanuts for extra energy. I’ve heard you have to book this trek months in advance. Which resources were the most helpful in making the journey happen? I spent hours and hours on the internet checking and comparing prices through a number of well known agencies, and planning the dates – you see, once you buy the permit, there is no going back. It is not refundable and you can’t change the dates. Not refundable, and you can’t change the dates. 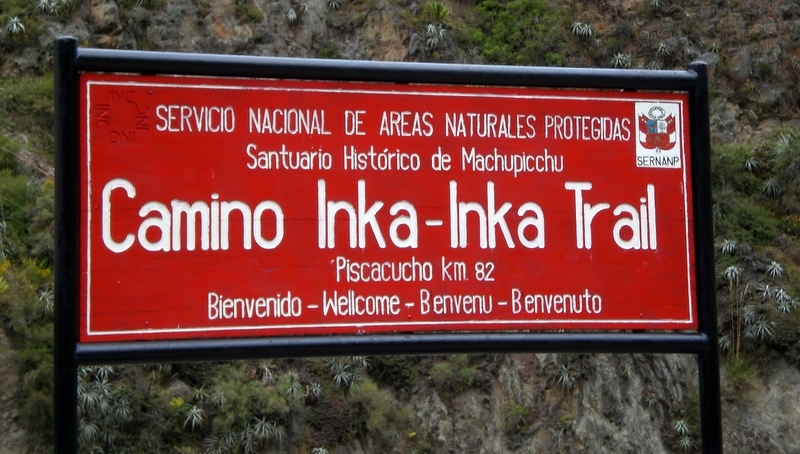 To make things easier, I actually have a few posts on how to plan the Inca trail on my blog now – so anybody interested can read them for some essential reference and starting point for further research. How much did the experience cost you? 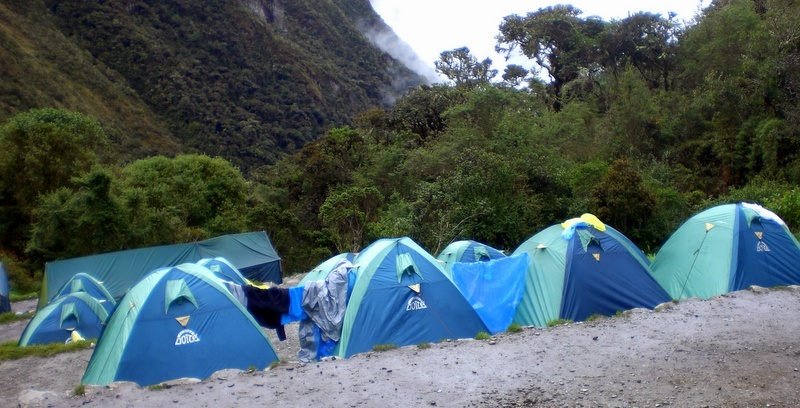 I spent $600 – that was the best deal I could get, and it included sleeping bag rental, porter rentals (to carry the stuff I did not need during the day, ie my bag with my clothes), and Huayna Picchu entrance. Other agencies may charge $800 for the same package; others even more. 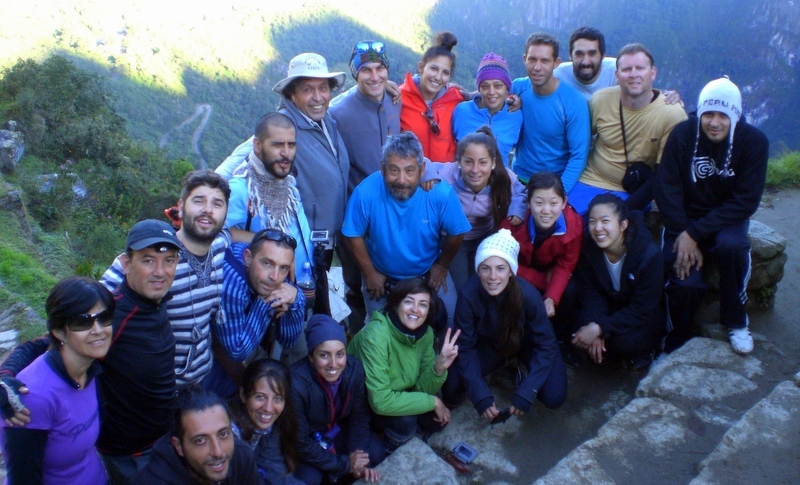 Without the porters, the Huayna Picchu and the sleeping bag it would have been around $450. No matter on the time of year you go, you will at some point get rain and it will be cold. April and May, right after the rainy season, make the scenery very lush. I liked it. The scenery is very lush in April and May. Looking back, would you do anything differently? I.e. training, preparation, gear, decisions along the way? I would carry more cash with me: it is a custom to tip the porters at the end, and I wish I could have given more than I had. They do a great job! 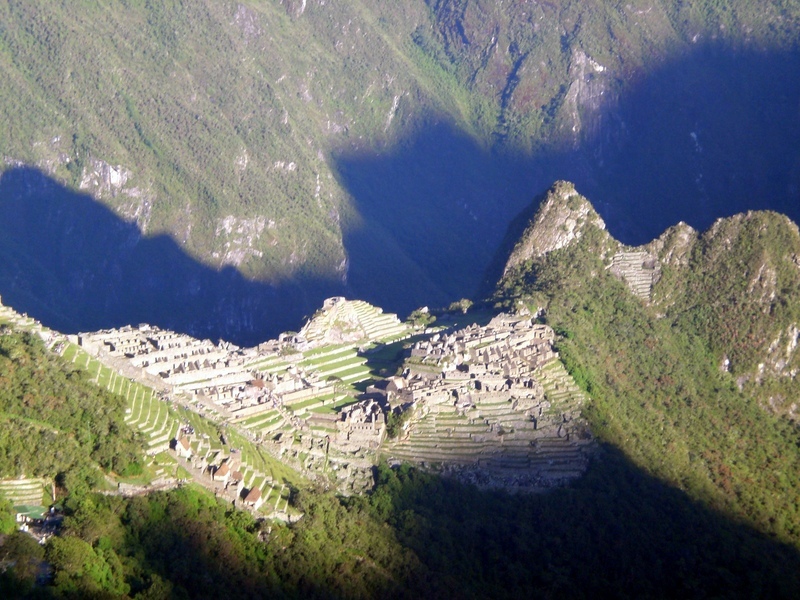 Why should people hike the Inca Trail to get to Machu Picchu instead of taking the train? This is a no-brainer, really. Aside from the challenge of the hike, from the sites that one gets to see and which would otherwise not be seen, the main thing is being able to see the sunrise from the Inti Punku. It was simply magic. I would do it again. In fact, I will do it again. Hear about new interviews on Facebook: Please click “like”! Hiking the Inca Trail: The Long Way to Machu Picchu! 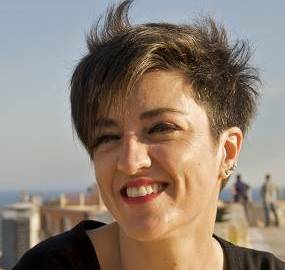 A former human rights lawyer and academic, Sardinian Claudia is an animal lover and, more than anything, a traveller who craves to see the world. In November 2013, she decided that it was time to leave and embarked on a 6 months trip through Central and South America, which changed her life and gave her the final input to live as a writing nomad. 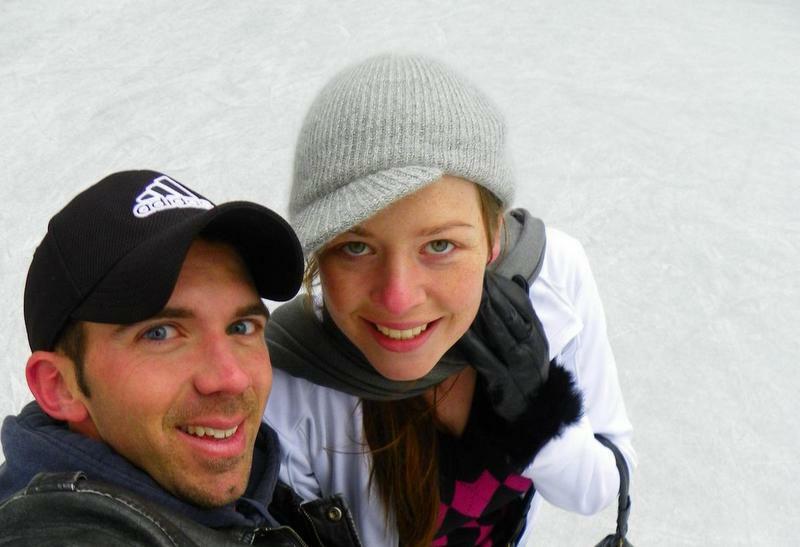 Her mission is to let people dream through her travels, providing guidance and inspiration to other backpackers. You can follow her adventures through her blog, My Adventures Across the World or on Facebook, Twitter and Instagram. Good for Claudia! I missed Machu Picchu due to sickness but can attest to those 4 seasons experienced during 1 day. I recall 73 F and super sunny during the day, getting sunburned on some days as it was so incredibly sunny. Then at night we’re talking 31 F, which means below freezing and since my apartment had no heating I was cold after midnight. Thank goodness, before midnight the daytime sun/heating kept the apartment warm but the temperate contrast was something else. Thanks for the share Megan! I think I remember reading about your sickness in Peru – so sorry to hear you missed it. Hopefully though you can plan for a return trip to complete the trip sometime soon! Thanks Ryan! So glad you enjoyed the interview! Amazing read. Good to hear April is a lush month as we’ll be there. We’re planning on doing an alternative trek as unsure of dates. I did the six day West Highland Way and suffered awful achilies problems which I’d never had before so slightly nervous about it! Plan to do a few two day treks on the way to build up, excited! SO excited for you – sorry to hear you had Achilles problems on your previous treks though; that’s never pleasant to deal with! Hopefully everything goes smoothly for you in April – can’t wait to hear updates from your trip and trek into MP! Great interview! I’m going to be headed to Peru in October and I’m dying to do the Inca Trail. Thank you for the good questions (Megan) and answers (Claudia) I’ll definitely come back to this! Thanks Jess! SO glad you enjoyed the interview – so excited for you to be traveling to Peru in October – you’ll have an amazing time, it’s such an inspiring journey. Definitely feel free to reach out if you have any follow up questions in the lead up to your trip. Hiking the Inca trail is a must while in Peru. The day we went we had clouds and rain but still made for some amazing photos. The altitude is no joke! I’m glad to hear that the clouds and rain didn’t ruin the experience – altitude is definitely no joke! You should! Happy trails :D! Thanks Barry, so glad you enjoyed the interview. All the best with your own trip – I hope you can make a trek to Machu Picchu happen soon! Just clicked on this link after reading your post on hiking the Camino. Hiking the Inca Trail to Machu Picchu has been on my list for a while now, and I need to make it happen soon. This was very informative and inspiring! 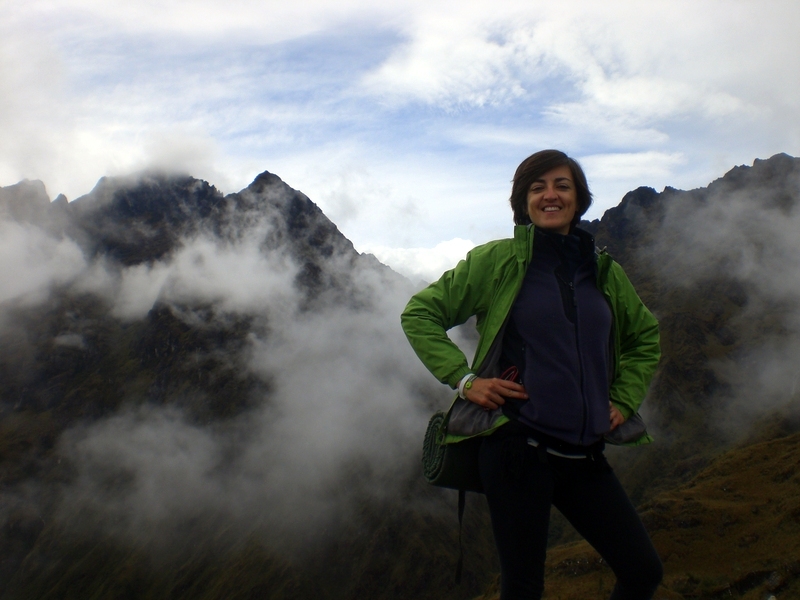 Woohoo glad to know people click through from those boxes :D SO glad you enjoyed the interview – the Inca Trail is on my list too, as is the Camino – perhaps we need to get a group trip going and plan out a year’s worth of epic hikes! Jillian from Canada here. I really enjoyed your post! I am really interested in hiking the Inca Trail to Machu Picchu with my husband. Although we are in our 30s, fit, and enjoy day hikes–we don’t really enjoying camping (and yes we are Canadian! Haha). I am worried about whether the 4 day trek would be too demanded especially if we both will not be able to sleep well in the tents. I have been researching that there is a 2 day trek offered by some companies that combines a train journey until kilometre 104 which apparently is the start of the trek on Day 1. Then we would hike for 4 hours to Wiñay Wayna and carry on until we are at Sungate, then back to Aguas calientes for dinner/bed at a hotel. On Day 2, we would take a bus from Aguas Calientes to Machu Picchu and there is a 2 hour guided tour of MP and we can also hike up to HP. Afterwards we would meet our guides back at Aguas Calientes and take the train back. This tour seems to be a good blend of our needs (enjoying some hiking but not sleeping in a tent) and seeing the key sites of the Inca Trail. Wondering if you could share your opinion on the latter. Do you think we are missing any of the “key sites” on the Inca Trail by not starting the trek from the usual starting point? Also, is 2 hours in MP sufficient time? Would love to know your thoughts. So glad you enjoyed the post. This is based on one of our guest blogger’s experiences with the hike, so I’ll shoot her a note and let her know your comment is here. Though I think from what you have described that the 2 day trek would probably suit you well and be fine for what you’re looking to take out of the experience. Mike and I did Machu Picchu last year, though chose to take the train the whole way because it was just down-pouring with rain. I didn’t feel like we missed out on anything having skipped the Inca trail, because I knew we wouldn’t have enjoyed it one bit in the rain. When it comes down to it you want to enjoy the time that you’re spending there. If you don’t feel like you’re up to the whole 4 day climb I would do the 2 day on the notion that you want to have a good time. 2 hours should be fine for MP itself, though you’ll need probably another few hours to complete the climb up and back of HP, which I highly recommend you do. We did HP and were so glad we did, the views are just incredible, and it’s a rewarding hike (challenging, but rewarding), so if you can make that happen then definitely do. Hope that helps! Enjoy your trip! Hi Marc, so excited for you! 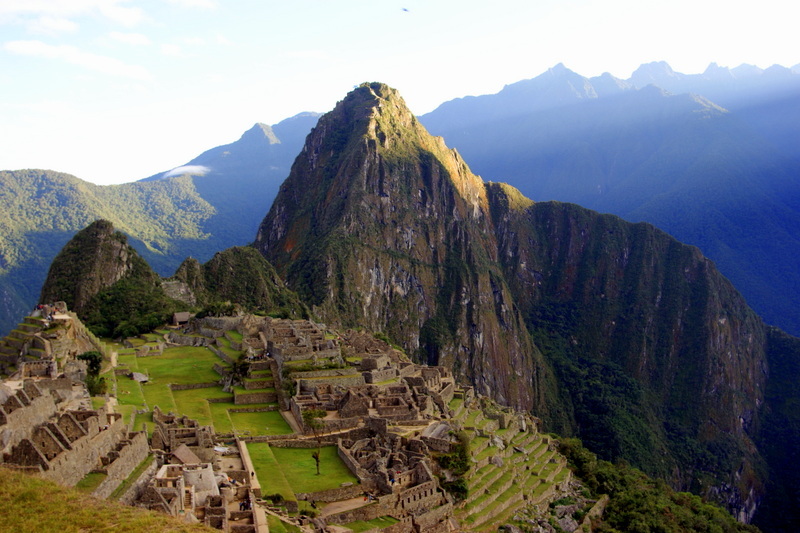 Machu Picchu is a magical experience – feel free to reach out if you have questions in the lead up to your trip. Excellent post, we did the Inca Trail route in one day. Our arrive to Cusco was nice, but we have troubles with the sickness altitude with my friend, and when we was desist of our trip, one excellent guide recommend and do their trip in one day. We recommend it. Camino Inca Machu Picchu Increible Experiencia! Lo recomiendo totalmente! mas alla del camino increible, la gente de Vamos Machupicchu muy buena!! los guias unos genios! la mejor experiencia. los guias Edwin y Eric muy amables y buena onda! voy a extrañar sus charlas durante el camino! Great hike Megan!. The Inca trail had always been on my bucket list for 15 years and so I headed to Peru on my own and have just had the most amazing 2 weeks with the highlight being 4 days trekking the Inca trail to Machu pitchu met a wonderful varied group of people who bonded so well and had so many laughs together ! The trek is challenging but so worth it ! I’d recommend it to anyone, Joel was the guide who do everything in his hand to do the best trek experience in my life. Regards! So glad to hear you enjoyed your time on the trail Jhon, it really is just as much a social trek as it is about the culture and history. Congrats on making the dream a reality and going for it!